Save an Extra 30% Off Sitewide! Shop the Valentine's Gift Guide! Find the perfect gift and save an extra 30% off sitewide at MyJewelryBox.com! Use Coupon Code: VDAY30 at checkout. Offer Ends 02/14/2015. Shop Now. Valentine's Day! Save an Extra 30% OFF!! Valentine's Day! Save an extra 30% off on the latest styles of rings, earrings, necklaces, bracelets, diamond jewelry and more at MyJewelryBox.com! Use Coupon Code: VDAY30 at checkout. Offer Ends 02/14/2015. Shop Now. Four invisible-set square princess cut diamonds are flanked by rows of gently glimmering round accent diamonds in this gorgeous engagement ring and wedding band set, crafted in 10 karat white gold. The pair is completed by a matching semi-eternity diamond wedding band, making the total carat weight of this set 1/2 carat (ctw). Bring tears to her eyes on your special day with this timeless and elegant pair. Buy this Princess Cut Diamond Engagement Ring and Wedding Band Set 1/2 Carat in 10K White Gold Was $899.99 Now $499.99 and Get Free Standard Shipping at MyJewelryBox.com. Diamond Double Halo Engagement Ring 1.0 Carat (ctw) in 14K White Gold Now $799.99. Twinkling rows of diamonds lead the eye straight to the center of this awe-inspiring engagement ring. In a gorgeous 4-prong setting sits a dazzling round brilliant diamond, surrounded by two majestic diamond haloes for spectacular effect. This ring also features an elegant split shank and diamond on the side profile. The total gem weight for this stunning ring is 1.0 carats (ctw). So buy this Diamond Double Halo Engagement Ring 1.0 Carat (ctw) in 14K White Gold Was $1495 Now $799.99 and Get Free Standard Shipping at MyJewelryBox.com. These striking stud earrings harness the power and beauty of tanzanite. With 1.50 carats (ctw) of the shimmering purple gems, these sterling silver earrings really pop. And buy this AAA Round Cut Tanzanite Stud Earrings 1.00 Carat (ctw) in Sterling Silver Was $59.99 Now $29.99 and Get Free Standard Shipping at MyJewelryBox.com. Holiday Guide Gift! Find the perfect gift at MyJewelryBox.com for that someone special! Shop Now. Cyber Monday Sale! Save 25% OFF!! Cyber Monday Sale! Save 25% on Latest Styles of Rings, Earrings, Necklaces, Bracelets, and Diamond Jewelry at MyJewelryBox.com! With Coupon Code: BFCM2014 at Checkout! Offer Ends 12/05/2014 11:59PM EST. 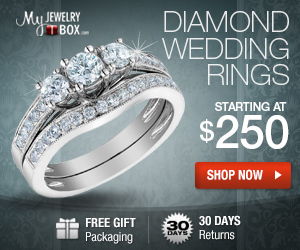 MyJewelryBox.com is the leading online jeweler with hundreds of thousands of satisfied customers. For all special occasions, holiday shopping and every day gifts, we offer an affordable solution to our customers. We have a catalog that features a wide range of styles of rings, earrings, bracelets, pendants, and necklaces in gold and silver, with diamonds and gemstones. Shop MyJewelryBox.com to receive the finest top-quality jewelry at unbeatable prices.